Cristiano Ronaldo was voted the most handsome football player in the Spanish League "La Liga", in a voting poll made online, by the newspaper "Marca". 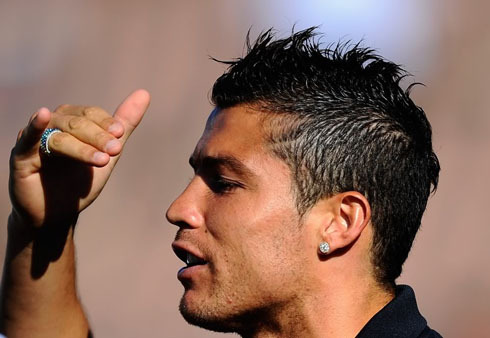 Ronaldo collected 22,8% of the votes and was followed by Fernando Llorente (19,1%) and Gerard Piqué (16,6%). Besides being one of the best football players this sports has ever seen, Cristiano Ronaldo also manages to be ranked #1 when it comes to ellect the most handsome football player in Spain. In a sort of beauty contest that Marca.com put online, Ronaldo won the first prize, proving once more that his fame and reputation doesn't have any parallel in football. CR7 finished this voting poll in first place, leaving the second place for Athletico Bilbao's Fernando Llorente and the third place to Barcelona's Gerard Piqué (Shakira's boyfriend). Even though this doesn't help him much on the pitch, Cristiano Ronaldo has always been known for caring and paying attention to his looks. The Portuguese player, who is currently dating the Russian topmodel Irina Shayk, certainly has a lot of people who hate him in Spain (may that be for envy or just because they are Barcelona fans), which somehow makes this "prize award" being even more surprising, coming from an online voting poll with a huge Spanish representation. In the other hand, Marca.com also opened a poll for the ugly side of the game. Real Madrid also ended represented in these rankings, with Angel Di Maria and Mesut Ozil taking the first and second places. Parejo and Puyol (Barcelona), finished 3rd and 4th place respectively. Real Madrid next match in La Liga will be on Saturday, the 10th of September, against Getafe, in the Santiago Bernabeu. You can watch Juventus live stream, Real Madrid vs Getafe online live streams this Saturday (10-09-2011), inside our Live Games Streams section. Cristiano Ronaldo will most likely be on the line-up in Real Madrid vs Getafe. The countdown clock timer, displaying the time left for the upcoming Ronaldo game, is shown on the top right corner of all pages.